D & B Haulage LTD – Going for Gold! D & B Haulage Ltd is a sub-contractor for Tarmac Industries and has been successfully transporting tarmac materials for the industry for a long period of time. D & B Haulage Ltd was first established in 2013, and has gradually built a reliable and efficient reputation for themselves over the years. In recent years, D & B Haulage Ltd has made the most noticeable and rapid improvements in their overall KMPL and emissions output since joining the FORS Scheme. Managing director of D & B Haulage Ltd, Tarsem Singh, explains how FORS has been beneficial to their company. We first discovered the FORS scheme when researching online how we could improve our HGV driver’s professional development by implementing better driving standards and processes, along with providing better forms of learning resources for our drivers. We saw the wide range of e-learning resources available on the FORS website and were pleased to learn that drivers were able to access these resources from their own home. Having worked with FORS to achieve bronze, silver and gold accreditations, we can confidently say that developing our drivers learning resources was a key factor on improving our business’ overall efficiency. When we began implementing the necessary procedures and practices required for our initial bronze audit, we noticed improvements within the company very quickly after beginning the bronze audit process. After successfully achieving our bronze accreditation, we were then encouraged to aim for the silver accreditation, where we noticed more rapid improvement within the business. Once we achieved our silver accreditation also, we then worked towards our gold accreditation which we achieved first time round. After becoming a FORS gold accredited freight business, we continued to make use of the e-learning recourses and toolkits in order to maintain our overall efficiency. One toolkit in particular that proved to be very useful was the congestion toolkit. This toolkit offered us a wide range of advice and guidance on how to reduce congestion when travelling on the roads, which in turn reduced our overall fuel usage and emissions output. One more benefit we took advantage of with the FORS Scheme, was having people in charge of management within the business complete the e-learning module, LoCity for Managers to help improve on the overall management of the fleet. Furthermore, management also made use of the LoCity Fleet Manager toolkit. This toolkit in conjunction with the e-learning module helped further develop the management of the company by improving the organisation of fuel and driver aspects of the business. 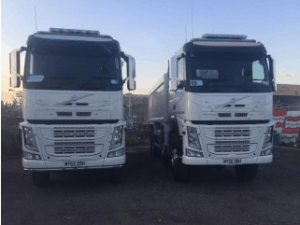 At D & B Haulage Ltd, we are consistently using the FORS gold standards and procedures to ensure that we are working at our most efficient level at all times. This has encouraged us to renew our current gold accreditation with FORS this year to provide as evidence to our clients that we are still carrying out our operations with a high standard that is approved by FORS. In the ­­­­­last twelve months, we have increased our KMPL by 1.9% thanks to FORS. In regard to health and safety procedures within the business, we take the appropriate precautions to ensure that we are operating safely. One precaution we take is ensuring our drivers are in good health and are fit to work to prevent any accidents caused by human error. We do this by having our drivers fill out a health questionnaire and requiring that they inform us of any changes in their state of health. If there are any concerns, we will then refer them to a GP for further consultation. When recruiting at D & B Haulage Ltd, we are open to hiring drivers with no previous tipper experience. We provide drivers that are new to the industry with a two week training program, where they are accompanied and assisted by one of our current and experienced drivers. This procedure helps ease the new driver into the business and also informs us of whether the driver is suitable for the job. At D & B Haulage Ltd, we are aware that our mode of work is a major contributor to the roads noise pollution levels. Our awareness has encouraged us to implement different methods and techniques to reduce our fleets noise levels. A lot of these new methods were acquired from the FORS anti-idling toolkit and the FORS Quiet Equipment Guide. At D & B Haulage Ltd, there are no alternative methods as of yet which we can use to carry out our work. However, to ensure that our vehicles produce as little harmful emissions, we replace our vehicles every 5 years with a newer vehicle. We are aware that there have been major developments in the electronically powered vehicle industry, and we plan to keep up to date with these improvements to see if they develop an electronically powered vehicle suitable for our mode of work. Our plans for the future at D & B Haulage Ltd is to continue working with FORS as it has been the most beneficial scheme we have worked with that continues to improve and better companies such as ours. We also plan to keep up to date and informed in the development of the tipper vehicle industry to ensure we are using the most environmentally friendly vehicles. Furthermore, we will also keep looking for alternative methods of transport for our mode of work. By having D & B Haulage Ltd remain a FORS gold accredited company, it will keep our credibility as a freight business intact and ensure our clients that we are still working at a more than satisfactory standard. We look forward to continuing to work and improve with FORS in the future as we believe that FORS is the key to success!